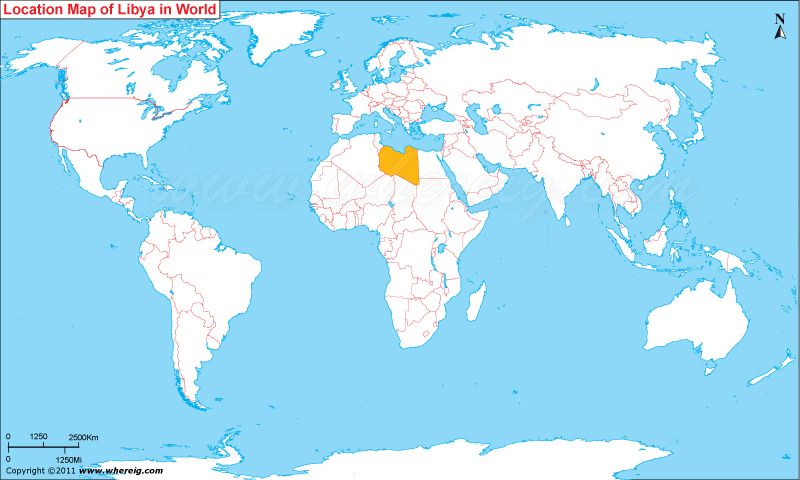 About Map: Map showing where is Libya located in the World. Where is Libya located on the world map? The given Libya location map shows that Libya is located in the northern part of Africa continent. Libya map also shows that it shares its international boundaries with Egypt in the east, Sudan in the south-east, Chad and Niger in the south, and Algeria and Tunisia in the west. However, in the north, Mediterranean Sea limits its northward extensions. Geographically, Libya is the fourth largest country in the Africa continent. In comparison of other African countries, Libya has the highest HDI and hence, it has fourth highest GDP (PPP) per capita in Africa. However, the reason behind this is of course due to the large reserves of petroleum that makes Libya – the tenth largest oil-producing country in the world. Moreover, the government type of Libya is under transitional phase because of the civilians are revolted for the transformation into the republic from the authoritarian type. However, very soon Libya will be also republic country.